Volunteer Opportunities for the Executive Committee Strategic Committees. Please volunteer for the Digital Presence committee as our social media aggregator. We need someone to help us create a news portal on www.siggraph.org that aggregates relevant content from Facebook, Twitter, etc., with optional commenting features. To start, we will need technical development for the design and mechanics of the aggregation and display. We estimate this will involve a commitment of 4 hours/week for one year, renewable if interested. Digital Presence is seeking a volunteer familiar with technical design, implementation, and moderation of Quora-style Q&A or limited Reddit-AMA-style sessions, which would allow greater access to experts in the field via www.siggraph.org. Please volunteer with the Digital Presence committee to act as our metadata editor. We need someone to validate content and correct errors in SIGGRAPH-related content in the Digital Library. This responsibility involves looking through the DL metadata XML files to troubleshoot problems. This is a one-time task, which we estimate will take about 100 hours over the course of 3-4 months. The Digital Presence strategic committee seeks several volunteers to work with the team to create and edit Wikipedia content. We estimate that this responsibility would require anywhere from 4 to 40 hours per article, depending on what topic you contribute and how much time you are willing to commit to the task. This would be an ongoing project requiring several volunteers to write about computer graphics and interactive techniques. We are looking for volunteers with strong research, writing, and editing ability to ensure readability and accuracy for each entry. Volunteer with the Digital Presence committee to manage our Wikipedia content creators and editors. The volunteer would work with members of the committee to identify a team of about two dozen volunteers to take on editing tasks to ensure that their articles related to computer graphics and interactive techniques convey the material accurately and clearly. This would be involve a six-month long term of 100 hours volunteer time. The Digital Presence committee needs your help to examine user-contributed assets in an online staging area and transfer acceptable content to the official asset storage area. This volunteer position will require 1 hour / week for a one year term (renewable if desired). Please consider volunteering with the Data Committee to work together with members of SIGGRAPH to collect and organize information about the organization, with the goal of making it accessible and useful. SIGGRAPH is developing partnerships with other conferences and working with our Chapters to help introduce SIGGRAPH to new communities. We will do this by “exporting” selected conference content so our Chapters can create smaller events that highlight the content of our two main conferences and to provide SIGGRAPH-branded content to partner conferences. 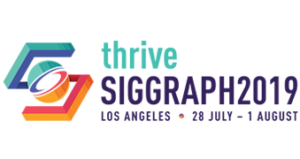 This volunteer position is responsible for working with the members of our SIGGRAPH Executive Committee, individual conference program chairs and our external partners to identify and help organize the appropriate content for these external programs. This would be a two-year term, requiring 15-20 hours/month of time as well as attendance of SIGGRAPH North America and Asia. As requests come in from our Chapters and external partners, the volunteer will be responsible for clarifying the needs and scope of the external conference, work with our conference venue chairs to curate the appropriate content and establish an effective logistics plan. We expect this to happen around 4-6 times per year. We need someone to who is well versed in the breadth of SIGGRAPH communities, well organized, have good communication skills and be able to travel. Please consider volunteering with New Communities as a workshop organizer. The volunteer would assist in proposing workshop topics, recruiting invited speakers, and vetting participant applications. The volunteer would work about 40 hours during the conference week. New Communities seeks a volunteer to help coordinate with technical papers chair, paper authors, popular press technical writer(s), conference organization and media representative, and ACM staff to prepare ~6 (one per paper) press releases for the SIGGRAPH and SIGGRAPH Asia conferences. All correspondence handled via email, with each paper generating about two dozen emails total. Estimated time commitment: 20-40 hours / conference. Term: one conference. Volunteer with New Communities to help recruit a committee of five people to review nominations for the SIGGRAPH Educator’s award, encourage nominations to be submitted, attend weekly meetings phone from February through April to select an award winner. Present the award at the opening ceremony at either SIGGRAPH or SIGGRAPH Asia. The volunteer can estimate a time commitment of about 40 hours per year. We’re looking for someone to work with us for a term of three years with the possibility to renew for a second term. Please volunteer with New Communities to help us approve mailing list posts, and promote and publicize the mailing list. This is a one-year volunteer term that entails about 10 hours per year of volunteer time. Volunteer with New Communities to help us further grow SIGGRAPH, by bringing in emerging communities, and working with established communities, to cultivate SIGGRAPH as the place that new and exciting technologies are discovered. We need a volunteer to recruit and organize Morning Talks and Sunday Workshops at the conference. Time commitment for this volunteer position is about 80 hours/year for a one year term. Nurturing Communities seeks a volunteer to help us develop a SIGGRAPH mobile app that would be available to users year-round. The app will support year-round engagement of the SIGGRAPH community. Initial responsibilities of this position will be to help determine requirements. We are looking for a volunteer who would be able to commit to 4 hours a week for a renewable one-year term. Nurturing Communities seeks a volunteer to work with the team to review and create content for the year-round SIGGRAPH app. The aim is to provide users with relevant and engaging content to connect researchers, practitioners and artists. This position would require about 8 hours of time per month; the term is one-year with the possibility of renewal. Love working with people? Nurturing Communities is looking for volunteers with strong networking skills within various SIGGRAPH communities to help represent those communities and provide feedback on what SIGGRAPH can do to meet their needs. Nurturing Communities seeks dedicated volunteer with the responsibility of answering SIGGRAPH Response Desk questions and/or route them to the appropriate group. Familiarity with the organization and people within the organization would be useful in this position. This requires a commitment of 2 hours/week as a one-year term, with the possibility of renewal. Volunteer with New Communities to help us analyze data from the app. One-year term, with the possibility of renewal. Volunteer with New Communities to help us set up the database, review, and help link mentors with mentees. One-year term, with the possibility of renewal. Volunteer Opportunities for the Executive Committee Standing Committees. Communications seeks a volunteer to help us edit and maintain the Events page of the www.siggraph.org website. This would require the volunteer to work 2-5 hours/week for one year. Communications seeks a volunteer to help us edit and maintain the News page of the www.siggraph.org website as well as maintaining the Call for Participation page of the website. This would require the volunteer to work 2-5 hours/week for one year. The social media outreach volunteer for the Digital Arts Community committee would help to post relevant information about the DAC and related SIGGRAPH and partner organization digital media topics to social media platforms including Twitter, Instagram, and Facebook, as well as the Ning site. Work with us if you have familiarity and interest in these areas. Commitment is 1 hour a week for a one-year, renewable term. Digital media assets committee seeks a volunteer associate chair to work with the team in managing the YouTube and Vimeo Channels, collaborate with Conference Chairs in determining best programs to live stream at the Conference, coordinate with the Conference Admin Group and A/V Contractor to capture predetermined Conference Sessions. Volunteer would also assist us in determining best delivery method of videos residing on the ACM DL to our membership. This commitment requires about 60 working hours a year, for a one-year term (possibly renewable for three years). The Education Committee seeks a booth manager to help the team organize and implement all aspects of Education Committee Booth at the SIGGRAPH Village during the conference. The volunteer would assist the committee in recruiting and scheduling booth volunteers, preparing all printed informational materials distributed at the booth, overseeing booth furniture and A/V setup in coordination with contractors, promoting Educator’s Meet and Greet, and managing Booth budget. The volunteer should also anticipate attending the virtual Education Committee meeting throughout the year. Estimated time commitment: 200 volunteer hours concentrated at conference and in summer months preceding conference (hours during conference counted as 3x towards this). About 2 hours / month commitment throughout academic year. The term is for one year (2 conferences – one as shadow, one as manager). May be renewable for an additional 3 years. The volunteer – with guidance from committee members – would help accessing the conference management database and retrieving certain text and image data for accepted contributions; preparing multiple spreadsheets with the retrieved data; inputting data into Microsoft Word via an established template; and light editing of prepared information, based on feedback from the conference management perseonnel. This would be a one-time task consisting of about 30-40 hours of volunteer time. Please consider volunteering your time as the specialized conference committee chair. Our team needs assistance with a number of tasks, including: approving conference requests for sponsorship; organizing the yearly meeting of sponsored conference committee members; interfacing with steering committees for sponsored events; liaising with sister societies and SIGs (for example, Eurographics, the IEEE Visualization and Graphics technical committee, SIGCHI, etc. ); approving closing event reports; appointing new committee members; and seeking out new events of interest to the committee. The volunteer would work closely with committee members to achieve these goals. This would require about 6-8 hours / week, for a two-year term.